Contrary to the last two “first days” we’ve had, our first day in Florence involved us going out and doing/seeing quite a bit! Of course, that’s largely because we really only have today and tomorrow to see the city due to a pre-planned day trip on Sunday (more on that later), so we wanted to make the most of the time we have. You already know all about our trip here and our apartment, so I’ll get right to our agenda. We spent most of our afternoon in and around Il Duomo, which technically means “church” but, in Florence, actually refers to a collection of buildings – the cathedral (also includes remnants of the former cathedral to Santa Reparata, which used to stand on the same ground), the baptistry, the dome, the bell tower, and a museum. We started off in the cathedral, which is, unsurprisingly, a pretty amazing building. I’ve been in lots of churches, but this one felt vast, possibly because it isn’t filled to the brim with seats and pews. 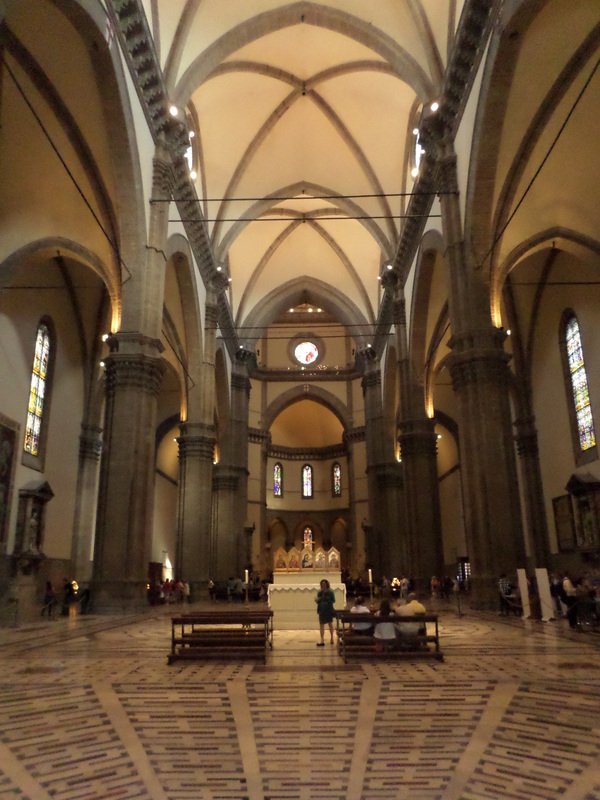 There’s a huge altar, stained glass, and amazing ceiling art (remember to look up!) and you can get through it relatively quickly. Don’t forget to check out the remains of the former cathedral to Santa Reparata close to the exit of the church (you’ll see a staircase going down). Although you may have to wait in a quick line to get in, admittance is free for this one building. Be sure to visit it! 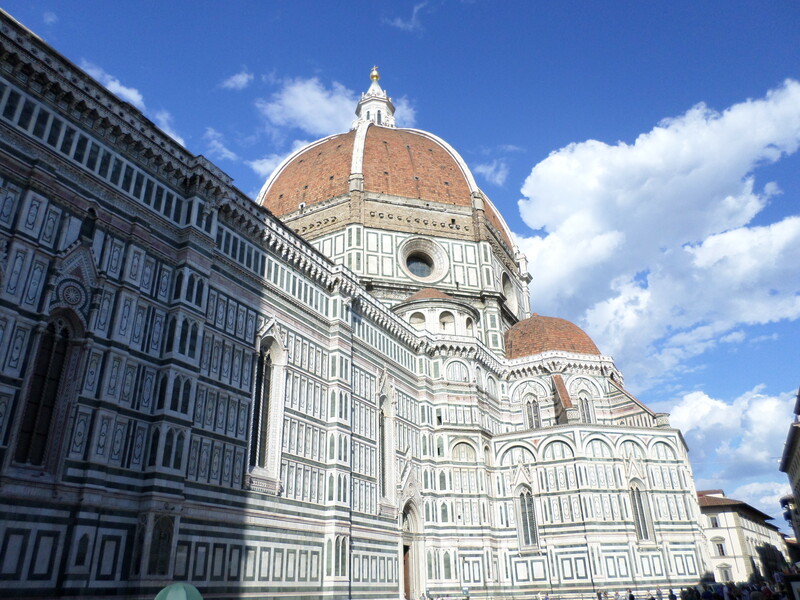 After a few minutes of wandering around to figure out where we needed to get tickets for the other buildings (FYI – the ticket office is almost directly in front of the baptistry), we got our all-inclusive ticket for €10. The ticket has a barcode and it gets you into each of the other buildings one time (the ticket is good for six days, but once you scan it, you have to use it within 24 hours). Pretty slick system! We decided we would continue our trend of climbing stairs on this trip by going to the dome, which requires you to climb nearly 450 stairs. TAKE NOTE – there is no elevator and no great way out once you start climbing, so be very sure that you want to do this before you start. Also, the stairways get very narrow at times and there is a stretch of stairs where you have to deal with people coming back down from the top, so it gets very crowded. If you are at all claustrophobic, I wouldn’t recommend this one! If you can do it though, DO IT! The views you get from the top are breathtaking, especially on a clear day. I included a few more pictures than normal just to show those views off, so check them out below. After the dome, we made a quick stop at the museum, which is undergoing some big renovations right now, so there isn’t a lot to see. I can’t comment on this one much because of that, but since it’s included in your ticket price anyway, you should stop and see it. And for you art lovers out there, I’m sure the completed museum will be great! 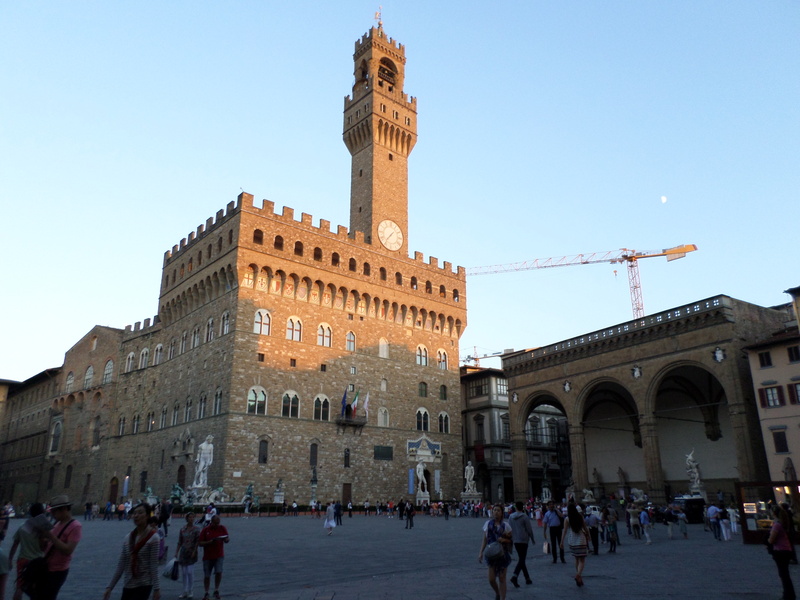 After some more wandering around (which included finding another juice bar for Scott), we decided to head over to the Piazza della Signoria, which is just a few minutes’ walk from the Duomo. Remember how I said the Spanish love plazas? Well, the Italians love piazzas! 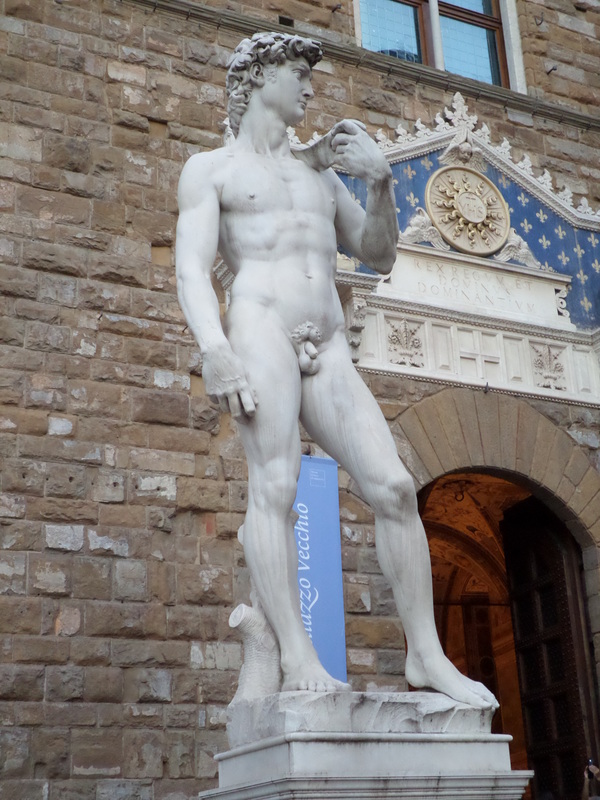 This is a great one to visit because it contains lots of cool buildings and some cool artwork, including a copy of Michelangelo’s David. 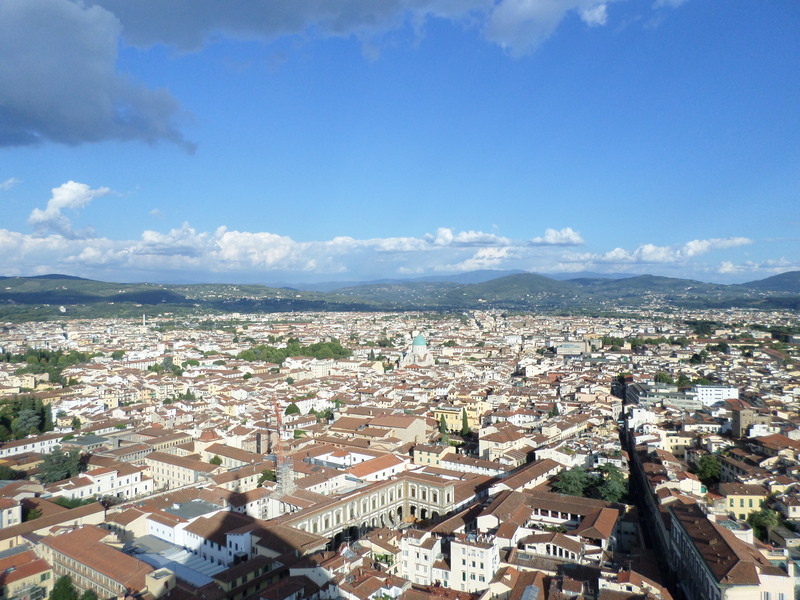 Although there are many piazzas to see in Florence, this is one you definitely want to make it to! The exterior of the cathedral. I told you it was amazing! The cathedral with part of the dome visible. The bell tower of the cathedral. 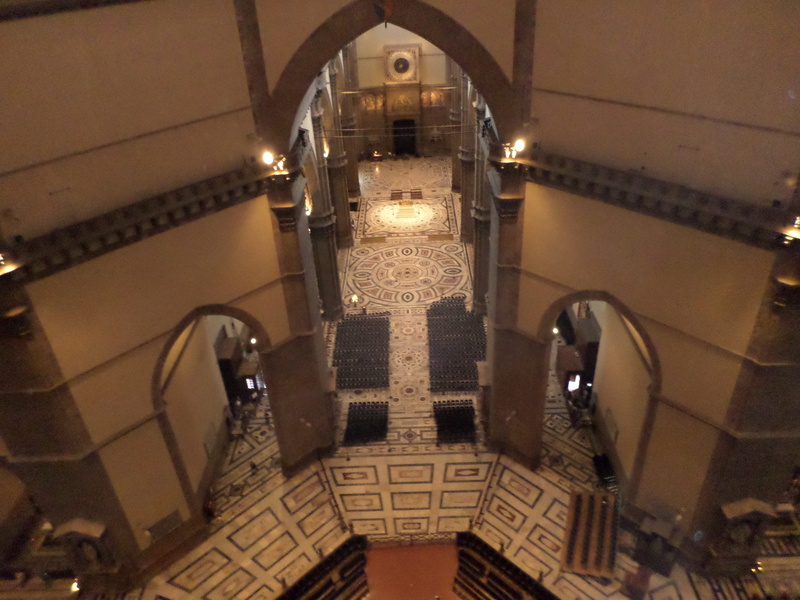 Looking towards the main altar from the back of the cathedral. A shot of the empty cathedral taken on our walk up to the top of the dome (the cathedral itself was closed by this time, which is why it was empty here). The view that greeted us at the top of the dome. And another great one. Views like this really make the panoramas worth it! 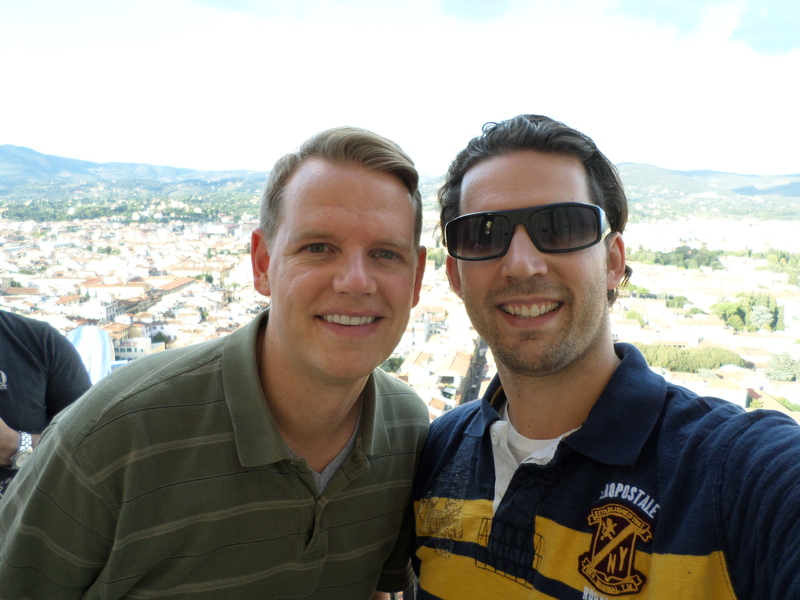 Me and Scott at the top of the dome. 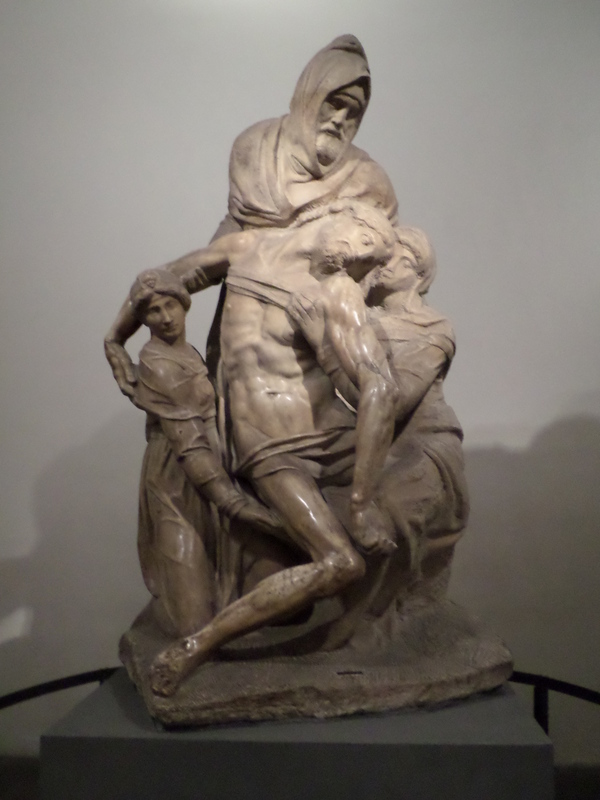 Amazing sculpture by Michelangelo – Pieta (one of the few things you can currently see in the museum). 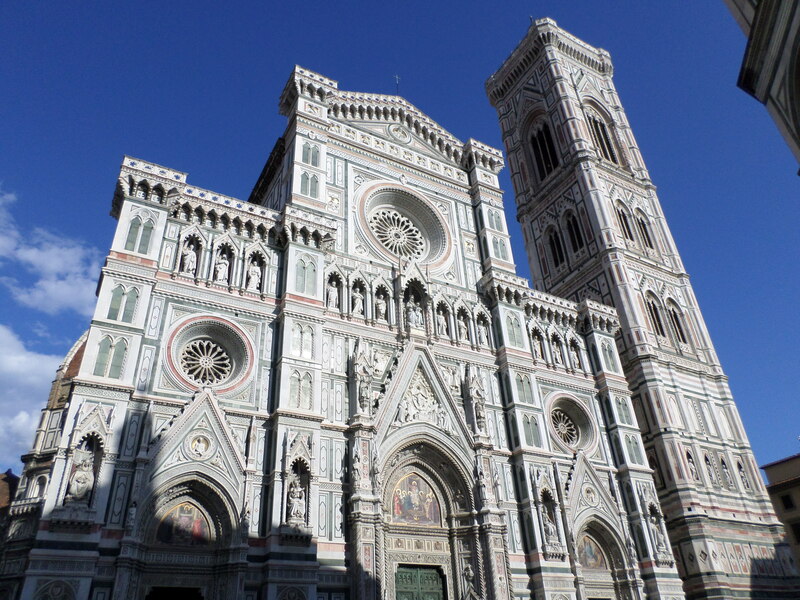 Another shot of the Duomo exterior taken after we left the museum. Look at the couple holding hands in the lower-right section of the photo! More to see tomorrow! 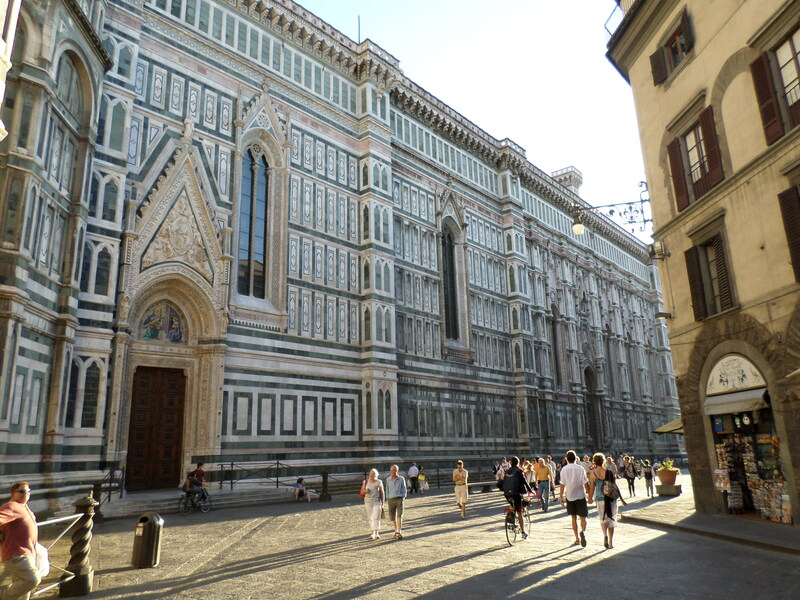 As I said, that will be our only full day to see Florence, so we plan to make the most of it. 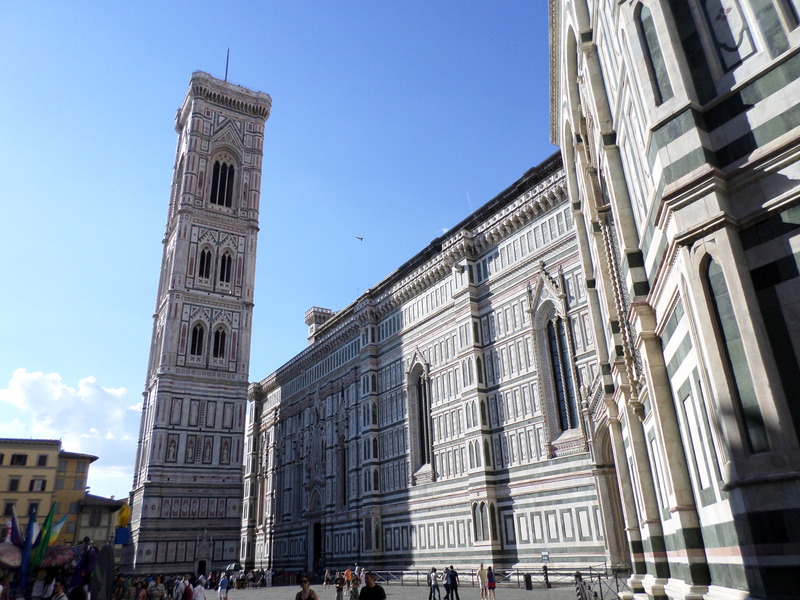 On Sunday, we have a day trip to the Cinque Terre and Pisa planned, so we’re hoping that will be great. Unfortunately, the forecast is calling for storms in both places that day, but we’re holding out hope that we can still enjoy the trip regardless. Cross your fingers for us! Makes me so happy to see these familiar sights again! 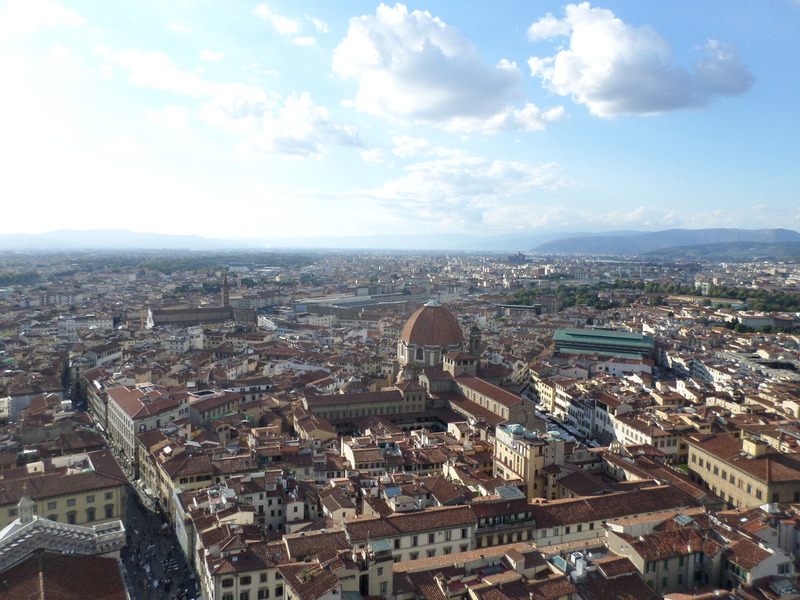 I loved Florence… I’m glad to see you’re enjoying it as well! The church sounds like a very modern one (at least, as far as the ticket technology is concerned). Amazing photos, once again. You have a great eye!